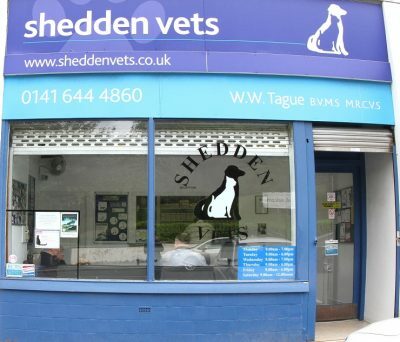 Shedden Vets are a small, friendly, 100% Pet Practice in Clarkston on the south side of Glasgow. The practice was established in February 1985 by William W. Tague. We are a Tier 2 Accredited Practice under the Royal College of Veterinary Surgeons Practice Standards Scheme. The Scheme was launched in January 2005 to establish a quality assurance framework to promote and maintain the highest standard of veterinary care. The team provides a friendly service covering all aspects of veterinary surgery and medicine (vaccinations, routine and emergency surgery, medical investigations, dietary advice, dental work to give a few examples). All the team at the practice are pet owners themselves and know how much a part of the family a pet is to their owner.